While the overall sound is pretty weighty, this is not as aggressive as the likes of the High on Fire; Bedowyn cover more of a middle ground. This is eminently listenable and surprisingly accessible stuff. “Cotards Blade” is a good example of the overall sound; riffs, elements of traditional metal, some time changes and definitely metal drumming (not rock, as it were) but it won't take your head off. “Blood Of The Fall” is a fine independent release by Bedowyn and a worthy addition to the stoner doom/heavy metal canon. Support the band and check it out. So, stoner doom is alive and well in the US with the likes of Bedowyn recording albums like this. After an intro, “Rite To Kill” sets the album up in grand style. The style is similar to early albums by The Sword or a more trad High on Fire, perhaps. There are fine riffs here, double tracked vocals and rolling bass drums aplenty. Heavy, for sure, but not drone or ridiculously slow. There is good lead guitar work and the vocals are clean but with the necessary grit that this style needs. The title track is a fine exercise in tasteful drumming and propulsive riffage. While the overall sound is pretty weighty, this is not as aggressive as the likes of the aforementioned HOF; Bedowyn cover more of a middle ground. This is eminently listenable and surprisingly accessible stuff. “Cotards Blade” is a good example of the overall sound; riffs, elements of traditional metal, some time changes and definitely metal drumming (not rock, as it were) but it won't take your head off. This is, to draw a comparison, late period Mastodon as opposed to early period Mastodon (not comparing material quality, just approach and placement on the metal spectrum). You will notice that over the course of the eleven tracks on offer here, none go over the line into the very long/ubiquitous prog track territory so beloved in the genre these days. Instead, the band keeps things pretty tight and focused- there are songs here and a clear effort has been made to produce a streamlined and solid record. It pays off, and allows the band to include a clutch of instrumentals (now that is METAL) including “For A Fleeting Moment” which continues in fine Sabbathian tradition by being acoustic. I am a huge fan of this most metal of album traits as it breaks up the record, allowing the album to shift from one part to another and allow some dynamics to be added. “Where Wings Will Burn” continues the acoustic motif for a time, and then we are into side 2 (in my way of thinking anyway) with vocals only appearing after a couple of minutes. The appropriately titled (given the end of days type scenes in Northern England at the moment) “I Am The Flood” offers almost spacey riffing combined with a fairly quick tempo. “Halfhand” starts out moody and acoustic (I like the use of acoustic guitar throughout the album) but makes use of the tried and true gentle and forceful dynamic. “Lord Of The Suffering” is the final vocal tracked song of the album and offers up some great passages of doom over its six minutes plus. Finally, the tricks of the intro are reprised for the instrumental closer. 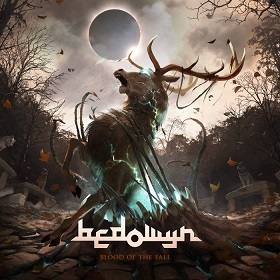 “Blood Of The Fall” is a fine independent release by Bedowyn and a worthy addition to the stoner doom/heavy metal canon. Support the band and check it out. You can stream the whole album exclusively in full below.